The Snowie Pincushion, Project 17 from Fast, Fun, and More Gifty, can be found on page 42. For all those lovers and collectors of pincushions, this little guy can be counted among them with his sweet, beckoning eyes and whimsical face. It might be difficult to put pins in him! LOL, love this fella! He was made with Quilter’s Candy Flannel. The base is 8539 Plaid-Sea Breeze and the face is 5550 Polka Dot-White Cream. He also has a tilted face to ease the pin deposit. ‘Look into my eyes and you will love me forever!’ Will do!!! The appliqué and embroidery are simple, the appliqué can even be done on a sewing machine as a time saver! Notice his face was stitched on a machine and he looks awesome! I love that turned up nose, don’t you?! Originally, Snowie was a flower called Happy Sunshine Pincushion. With a few slight changes, she became Snowie and is just as darling! You can find this fun little project and others like it in my new book, Fast, Fun, & More Gifty now! Both are just too cute! Thank you Barb! 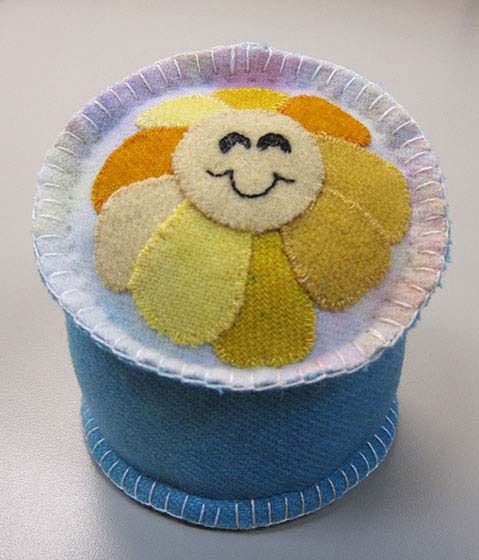 I love them both as well, though I’ve only made the Happy Sunshine pincushion so far.